Students in today's schools are becoming more academically diverse. There are more students identified for more exceptionalities in special education, more students for whom English is not their first language, and more students struggling to read. There is a need to ensure challenge for advanced learners when accountability pressures focus on basic competencies, and a growing economic gap exists between segments of the student population. It seems unrealistic to think that all those students will thrive in classrooms that disregard their learning differences. In fact, a look at indicators such as grades, student discipline, attendance, college acceptance, dropout rates, and standardized test scores confirms that school is not working well for too many students. Differentiated instruction seems promising as a response to the variety of learning needs students bring to school every day. It makes sense to encourage teachers to be mindful of and responsive to their students' diverse learning needs. But what would the school leaders be asking teachers to do by encouraging them to differentiate instruction? What does differentiation look like? And would benefits to students and teachers be worth the tension and effort such a change would require? Are there avoidable errors that leaders should keep in mind? What does it mean to lead for schoolwide change for differentiation? We often hear fellow educators say, "We're doing differentiation in our school this year. Could you come help us?" Not surprisingly then, we also hear, "Our teachers know about differentiation, but nobody seems to do much with it in their classrooms." We also visit classrooms where "differentiation is happening," go to conference sessions, and even read books that revisit the truth that a little knowledge is a dangerous thing. On the one hand, it's positive that educators are having a conversation about how to teach with an eye to individual learner needs. As we'll discuss later, there is more than ample evidence of a need for that conversation. Further, it speaks well of us as educators that we see and acknowledge the varying needs of our students. On the other hand, shallow approaches to differentiating instruction for academically diverse learners will serve neither the students nor the profession well. Mandates for classroom change and drive-through approaches to staff development likely will do more harm than good. They may result in some modifications for some people over some period of time, but they are seldom catalysts for broad, widespread, and enduring change. In addition, surface approaches to deep issues trivialize problems and convince teachers that shortly the wind will shift and the gnats that are pestering them will go away until a new breeze blows through. In this book, we hope to provide a more substantial way to think about substantial change on behalf of a substantial need in our schools. It is our intent to (a) clarify the tenets of "defensible differentiation," (b) specify key principles and practices of leadership for meaningful change in classrooms and schools, and (c) illustrate how it looks when educators commit to making durable changes in teaching—in this case, to implement differentiated instruction in classrooms throughout a school. To set the stage for the rest of the book, this chapter will first highlight some key elements of defensible differentiation. Next, it will take a look at the complexity of educational change. Finally, it will introduce two schools that made differentiated classrooms a schoolwide reality and whose change journey will provide practical and concrete illustrations through the rest of the book. There is a great deal already written about what we call "differentiated instruction." This section of the chapter will not try to repeat or even summarize that writing. What it will do is address some misconceptions by outlining what differentiation is and is not, and it will highlight essential elements of defensible differentiation. The point is to remind educational leaders (a term we use to include teachers and administrators who are wise and informed pace setters for their colleagues) that solutions to educational problems do not lie in names or in labels but in quality practice. Calling something "differentiation" provides no guarantee of its efficacy for students. Leaders must continually be attuned to fidelity of practice and continually ask themselves and others, "How does what's happening here make sense for learners?" Differentiation that's likely to make a positive difference for students will have some attributes and—more to the point—will not have others. Figure 1.1 suggests some misconceptions about differentiation that, turned into practice, can dilute or damage student outcomes. It also points to some indicators of defensible differentiation. Every student has particular interests and learning preferences as well as a readiness level that varies over time and context. Each learner needs appropriate support. Differentiation is not something you do when the real lesson is finished. It's integral to ensuring that each student has access to success with key content goals. Effective differentiation always enables a student to do more than would be possible without it, not less. A goal of differentiation is ensuring that each student succeeds with whatever is important for him or her to know, understand, and do. Flexibility is a hallmark of differentiation, but no single instructional strategy is required to differentiate effectively. Effective differentiation requires use of flexible grouping patterns so that students consistently work in a variety of groups based on readiness, interest, learning preference, random assignment, teacher choice, and student choice. When students are removed from their classrooms and placed with students deemed similar in other classrooms, a kind of tracking is taking place. Real flexibility is lost. Learning profile is one-third of the domain of differentiation and consists of learning style, intelligence preference (there are two strong models addressing intelligence preference), gender-related preferences, and culture-related preferences. A single approach to intelligence preferences in the classroom is a narrow segment of the big picture of differentiation. See note above. Attention to learning style is helpful for some students some of the time and helps teachers learn to be more flexible, but it leaves other needs unaddressed. There are times when it's important for teachers to assign particular work to students because it will move them forward in key ways. At other times, it makes good sense for students to call the shots and learn about making wise choices. Although it is an aim of differentiation to focus on individuals, it is not a goal to make individual lesson plans for each student. Struggling students don't often benefit by doing less of what they don't understand, and it's not helpful for advanced learners to do more of what they already know. Differentiation asks students to work with essential understandings at varied degrees of complexity and with varied support systems. Information-based tasks and skills-based tasks should be congruent with students' current needs. Differentiation should be responsive instruction, not mechanical instruction. At times, whole-class instruction is important and effective. Teachers need to build community as well as attend to individual needs. The most powerful differentiation is based on pre-assessment and ongoing assessment of student progress toward key goals. The teacher uses the assessment information to make proactive plans to address student needs. Some improvisation is still needed, but it is not a dominant means of differentiation. Key elements of effective differentiation are important for leaders to understand. They are the mileposts that change efforts should be moving toward—nonnegotiables of the model. Each of the nonnegotiables is aimed at one shared goal—greater academic success for the broadest possible student population. The nonnegotiables are respecting individuals, owning student success, building community, providing high-quality curriculum, assessing to inform instruction, implementing flexible classroom routines, creating varied avenues to learning, and sharing responsibility for teaching and learning. This brief capsule of differentiation is not meant to be exhaustive. Readers should feel free to add elements, descriptors, misconceptions, and so on. The intent of this section of the chapter is simply to serve as a reminder that the kind of differentiation that is likely to make a difference in the lives and achievement of students is both fundamental to good teaching and very complex. As the book proceeds, it's important to have a sense of the scope and degree of change that defensible differentiation requires. Only in science fiction do individuals arrive at distant destinations in an instant. Nonetheless, it's critical to have a clear sense of the destination, the distance to it, and the reason for going there in the first place. To understand those things is to begin to develop a sense of why real change in schools is so challenging. The literature on school change is rich, varied, and multifaceted. Again, there is no formula or recipe for change, yet persistent themes arise in the literature. Two of those themes appear contradictory. The first is that in schools "real change is real hard" (Urbanski, 1993, p. 123). The second is that change is quite possible and not beyond the reach of ordinary educators in ordinary schools (Fullan, 2001b). In fact, these two themes are not as oppositional as they may seem. A fair translation of the literature on school change is that we know a lot about what supports change and a lot about what discourages it. If we just did what we know to do, we'd generally find improved outcomes for students and their teachers. The challenge—as always—comes in living out the details. For this book, we have drawn on the expertise of researchers who have devoted their careers to understanding the process of school change. Our intent is not to represent all that these experts have to say. Our intent is to capsule and spotlight key insights from that literature as it relates to change for more academically responsive classrooms. Through the rest of the book, we'll be looking at principles and practices from the current best understanding of school change. These principles and practices offer no guarantees of success, yet they support educational leaders' efforts to be catalysts for schools and classrooms that can better help each student construct a promising future. To establish a context for what follows in the book, Figure 1.2 provides some themes from the literature of school change that suggest why our efforts at change too often fall short. We are unaware of or unprepared to deal with implications of the change in classroom practice. We tend to deal with the change on a superficial level, tend to neglect fidelity to the change, and are often unprepared to deal with the fear, tension, loss, and conflict that inevitably accompany change. We often overlook what teachers perceive to be competing mandates. It's profoundly difficult to change major life routines even when we have a good reason to do so. A mandate seldom seems like a good reason to the people receiving the mandate. Leaders for change are necessarily keepers of a vision, well informed about the vision, communicators, cheerleaders, taskmasters, diplomats, and ministers. Leading is a very different thing from telling. The more the change effort affects actual classroom routines, the more support it requires. That implies long-term and reliable presence of information, coaching, feedback, collaboration, guided reflection, materials, and reassurance—to name a few elements. It's easy to assume that we can merely ask people to change a practice. In fact, making change requires alteration in beliefs, attitudes, practices, use of materials, and the culture of the school itself. To neglect any of these is to undermine the possibility of change. Significant change is evolutionary. It does not happen as a result of a few professional development sessions or because a school "does" the initiative "this year." It is likely that evoking significant change takes many years and then must be nurtured indefinitely. Teachers have high-stress jobs as well as personal lives—and varied levels of professional expertise, varied approaches to their work, and varied ways of learning. Those factors must be accounted for to support change. No blueprint for change will endure exactly as it was conceived. Nonetheless, it is critical to have a plan and to ensure that stakeholders understand the plan, what is expected of them in the plan, and what support will be available to them throughout the process. It's easy, but unfortunate, to discuss a change initiative without ensuring that it remains focused on the students who will experience it. If a change initiative positively affects students, teachers will find a ready motivator to continue. If it does not, leaders need to reexamine the implementation or reconsider their direction. It's not about the initiative. It's about what it can accomplish. We often ask teachers to do too much all at once. We move too fast and overwhelm people, or we move too slowly and lose momentum. The scope and pacing of change are critical to its outcome. This book focuses on how to support classroom changes that result in teaching that is more responsive to—more effective with—academically diverse student populations. The movement toward defensibly differentiated classrooms is a particularly complex kind of change. It affects virtually every facet of how teachers think about and carry out their work. It is therefore demanding for teachers and demanding for those who provide leadership and support for that journey. As noted earlier, we believe such leadership includes administrators, classroom teachers, specialists, media specialists, counselors, and other key personnel with the potential to improve classroom instruction. 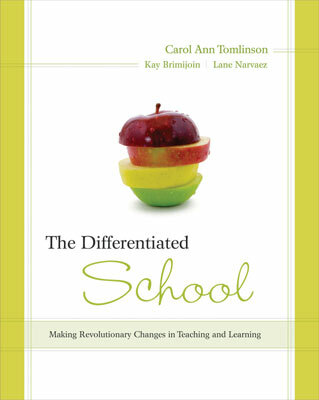 We examine change for differentiation at the school level rather than at the individual teacher or district level. We have made that decision for two reasons. First, it is always the case that some individual teachers and small groups of teachers seek out ways to alter their classroom practices as a matter of professional growth. Those teachers are gifts to the schools in which they work and the students with whom they work. The value of their efforts should never be underestimated and should always be affirmed and supported. Nonetheless, it is unlikely that the degree of change needed in schools will result from one-teacher-at-a-time, self-initiated efforts. Second, although district-level change is certainly necessary for educational equity and excellence, it is far more difficult to achieve than school-level change. In any case, district-level change must ultimately happen on a school-by-school basis. A major goal of this book is to clarify what we know about school change as it relates to change for defensible differentiation. It has made a world of difference for us to see the principles of change move from the pages of books and into faculty meetings, classrooms, professional development sessions, coaching sessions, collaborative teaming, and hallway conversations. Therefore, we have elected to illustrate the principles that guide effective school change as we have seen them play out in two schools that have accomplished buildingwide change toward defensibly differentiated classrooms for the purpose of improved school experiences and achievement outcomes for more students. In the final section of this chapter, we'll introduce the two schools that have helped us see change in action and that we believe will help readers of the book in similar ways. Because, as the experts tell us, school change is both difficult and possible, it is important to examine settings in which people have come together to examine beliefs, change how they think about what they do, and ultimately change classroom practice to the benefit of students. In this book, we'll share experiences from two such schools. The illustrations they provide help make concrete the more abstract principles of defensible differentiation and school change. Our goal is not to tell the story of either school in a linear way, but rather to select instances that illustrate key facets of the change process as each school developed classrooms designed to better serve each student. A couple of caveats are useful here. First, these are not perfect schools. There is no such thing. The educators in the schools would be the first to say there are—and always will be—facets of their work they would like to change. What sets them apart, in fact, is not perfection but dogged determination to improve. Second, their work with differentiation is not finished. In both instances, the educators in the schools would be the first to say there is still hard work to do. Third, their change journeys have not been neat, tidy, or without conflict. The educators in both schools would be the first to say there have been periods when the journey seemed overwhelming. That said, the educators in these two schools have done more things right and fewer things wrong along the course to change than is often the case in schools. For that reason, they have much to teach us about how deep classroom change can become a reality—and more specifically, how deep classroom change in regard to academically responsive or differentiated instruction can unfold. Figure 1.3 provides some basic demographic information about Conway Elementary School and Colchester High School. At the time when the Conway Elementary School staff began its formal work with differentiated instruction in 2000, Lane Narvaez had been the principal at Conway for five years. Prior to that, she had been a high school assistant principal for five years and a teacher at all levels. Ladue School District, in which Conway Elementary is located, is a high-achieving district with approximately 92 percent of graduates attending college. The district has one of the oldest merit pay programs in the country. These factors converge to create high parent expectations and a stable, well-paid teaching force with high standards and a strong work ethic. On the one hand, it would be easy to look at Conway and conclude that working conditions were ideal and change would be easy to accomplish. In fact, Conway was a good place to work. It was characterized, however, by two factors that often work against change. One is a highly aspirational, highly involved group of parents who can effectively derail change if they feel it will negatively affect the status quo. A second characteristic that makes change very difficult is that Conway was already widely known to be a "very good school." Given the aversive nature of change, when a teacher or a school has the reputation of being excellent, it is natural to eschew suggestions about making significant changes in practice. Why would a faculty undertake the rigorous and risky journey to an uncertain destination when their current place in the world is celebrated? If it's difficult to achieve commitment to school change among faculties in general, it is far more difficult to achieve buy-in for change in schools whose names are synonymous with quality. There is much to learn from the Conway faculty about making a very good school great. At the time when Colchester High School began its formal work with differentiated instruction in 2000, Joyce Stone had been principal at Colchester for one year. Prior to that, she had been a high school teacher for 24 years, an assistant principal and special education coordinator in a rural district for seven years, and the assistant principal at Colchester for two years. At that point, Colchester High was a school in trouble both academically and affectively. Student discipline was poor, there were intractable divisions between academic "haves" and "have-nots," test scores were low, the dropout rate was high, and the community was growing increasingly uneasy with the school. Unlike Conway, the Colchester faculty did not have a record of unimpeachable quality to shield them from a need to change. Nonetheless, it is profoundly difficult to bring about schoolwide change in a high school when that change requires pervasive alteration of teachers' perceptions about students, scheduling of classes, and classroom instruction. The faculty of Colchester has undergone an individual and group metamorphosis in all those areas. There is much to learn from them about rethinking fundamental aspects of schooling—even at the secondary level. Undertaking substantive change in a school is not—or ought not to be—for the sake of change. It should be designed with specific positive teacher, student, and schoolwide benefits in mind. It is toward those intended outcomes that the initiative should progress and against which the success of the initiative should be assessed both formatively and summatively. Over time, it is likely that some of the initial goals will change. Some may not be fully realized, and there may be unanticipated benefits as well. Specific outcomes targeted by the Conway and Colchester faculties for their work with differentiated instruction will be discussed in Chapter 2. Here, we want to highlight positive outcomes of the change initiatives in the two schools during their first few years. Sergiovanni (1999) reminds us that if we judge the success of a school solely on test scores, we set our sights too narrowly. Excellent performance would include good test scores but should also extend to student, parent, and teacher satisfaction, increased student engagement with learning, enhanced professional efficacy of teachers, and so on. Both the Conway and Colchester faculties are appropriately proud of standardized test scores that show broad growth across the student population. They are also proud of other indicators of success. The suggestions of success noted for both schools in the following sections are just that—suggestions of success. These are not data derived from an experimental study but rather garnered in the course of living out several academic years in particular schools. At Conway, two achievement tests have served as benchmarks for academic improvement—the TerraNova and the Missouri Assessment Program (MAP). The TerraNova is a nationally normed test administered annually to 5th grade students with test scores reported in terms of a Normal Curve Equivalent (NCE) with a mean of 50 and a range from zero to 99. Because Conway students are generally high performing, the school uses an NCE of 65 as its indicator of comparison. Figure 1.4 shows pre- and postdifferentiation scores for Conway 5th graders. Although the table shows an increase in scores during the years of differentiated instruction, other factors played a role during the six years under study. First, enrollment decreased, causing smaller class sizes. Second, Conway's Voluntary Transfer Program ended, resulting in fewer students transferring to Conway from city schools. In order to determine the effect these variables had on test results, the general linear model was used to implement analysis of variance (ANOVA) and a regression. Results showed that differentiated instruction was associated with a significant difference in test scores. That is, student test scores were higher during the years that differentiation was in place. Note: Scores based on TerraNova Normal Curve Equivalent of 65. The school uses 65 as a point of comparison because of the large number of students who score above 50, which is the typical point of comparison in schools. The MAP is a state-administered criterion-referenced test that includes multiple-choice items, constructed-response items, and performance items. Scores are reported in five steps, with Step 4 (Proficient) and Step 5 (Advanced) indicating students are above grade level and have met state standards. MAP test results likewise show a dramatic and positive shift during the first three years of the differentiation initiative in comparison to the three years prior to the beginning of the initiative (see Figures 1.5 and 1.6). A simple average of the percent of students who met the state standards during the three predifferentiation years in comparison with the first three years of the differentiation initiative shows communication arts pass rates moving from 61 percent to 69 percent, science from 71 percent to 76 percent, math from 64 percent to 79 percent, and social studies from 59 percent to 83 percent. The state scores were not only lower during the six years, but they also remained relatively static. Figure 1.6 also shows that the percentage of students scoring in the top level (Step 5) increased during the years of differentiation. It is also important to note that the number of students receiving Step 1 and Step 2 MAP scores (lowest levels) at Conway decreased during the first three years of the differentiation initiative. Test scores from the 2004 and 2005 school years show this test pattern continuing. Using either the TerraNova or the MAP as the test measurement, Conway students demonstrated dramatic improvement in performance during the years of the differentiation initiative. During the first three years of the differentiation initiative, Conway ranked as one of the state's top 10 scoring schools in reading, math, and social studies. In 2003, it was named a Gold Star School of Excellence by the Missouri Department of Elementary and Secondary Education and, in 2007, a No Child Left Behind Blue Ribbon School by the U.S. Department of Education in recognition of the school's high test scores, professional development initiatives, programming, and parent involvement. Student, parent, and teacher response to differentiation was also largely positive. Those perspectives will be discussed in later chapters. Unlike Conway Elementary School, student achievement scores at Colchester were generally mediocre to weak when the differentiation initiative began. Results on the New Standards Reference Examinations (NSRE) indicated substantial growth during the first six years of the differentiation initiative at Colchester, as shown in Figure 1.7. College attendance increased from 68 percent in 1999 to 74 percent in 2006. The number of Advanced Placement sections increased from six in 1999 to 13 in 2006. (The number of students achieving honors status on the NSRE between 1999 and 2006 rose in every subject tested—often dramatically (for example, from 17 percent to 29 percent of students achieving honors status in writing conventions, from 19 percent to 46 percent in math skills, from 15 percent to 25 percent in math concepts, and from 8 percent to 15 percent in math problem solving). Disciplinary interventions dropped by 42 percent between 2000 and 2006. Expulsions declined from seven in 2001 to one in 2006. The dropout rate decreased from 6.9 percent in 1999 to 1.03 percent over five years. Qualitative measures documented significant improvement in school climate for teachers. On the surface, Conway Elementary School and Colchester High School appear to have little in common. Located in two different regions of the country, one serves younger students and one serves older students. One began the change journey as a school of excellence; one began as a school in trouble. One school's student population is relatively affluent; the other school's student population represents the haves and havenots. As will become evident in later chapters, one school's principal envisioned differentiation as a way to ensure challenge for the school's most able students; the other school's principal envisioned it as a means to ensure equity for the school's struggling students. In the end, however, the two schools also share important attributes: courageous leaders with a clear vision and the will and skill to act on the vision, faculties willing to engage in sustained reflection, and a blueprint for change sufficient to the challenge of change. In the chapters ahead, we'll examine how the schools reconceived instruction to focus more effectively on individual learner needs, how they created guidelines for navigating this type of change process, and how the change played out in these two schools.